Nirvana Rose by Elizabeth and James - The floral oriental fragrance for women includes a dark rose scent with notes of May rose, a green note of geranium, and earthy vetiver. Housed in the classic Elizabeth and James textured perfume bottle in deep red with gold accents, this smoky rose fragrance was launched with Nirvana Bourbon in August 2016, and available in an eau de parfum spray and rollerball from Sephora. Package Design Original Elizabeth and James Nirvana bottle with dark red glass and gold accents. They cost less than a full-size fragrance and look damn cute - no wonder purse-portable rollerballs are having a moment! These seven make up a stellar scent wardrobe. Having conquered luxury with their award-winning collections for The Row, the twin talents put their contemporary label in the spotlight. 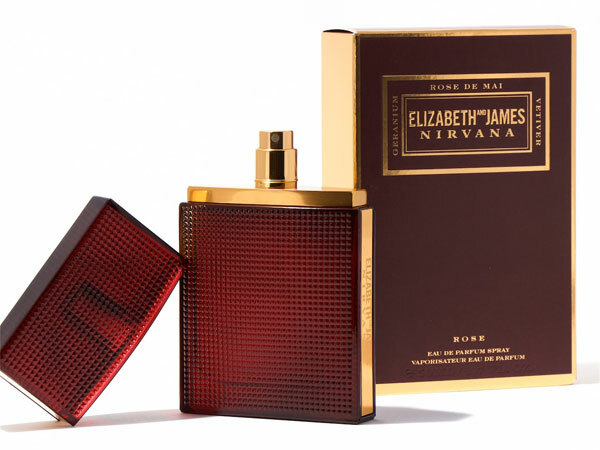 Three years after the original Nirvana Black and White fragrances became blockbusters, Elizabeth and James is adding two new scents: Bourbon (a smoky vanilla) and Rose (as in the flower, not the wine). "These reflect the colorful, playful side of life, the imagination and the fun," says Mary-Kate. As for Ashley, "I have a soft spot for the rose." The latest in fragrance, skincare, hair, and more. A rose isn't always a rose. Four scents offer new takes on the perennially popular note.